In a heavy dutch oven pot, melt 1 tbsp. butter or olive oil over medium heat. Add chopped vegetables, add salt and pepper, and cook until softened. Spoon all of the vegetables into a bowl and set aside. Add remaining butter or olive oil to the pot and drop in mini-meatballs. Cook until just browned. Add back in cooked vegetables and stir to combine. Add 8 cups of chicken stock and bring to a boil. Once boiling, reduce to a strong simmer. Add the dried pasta and cook in rapid simmer until cooked through. Drop the kale in the pot and stir. Let simmer until kale is wilted and soft. Check for seasoning. If needed, add salt and/or pepper. 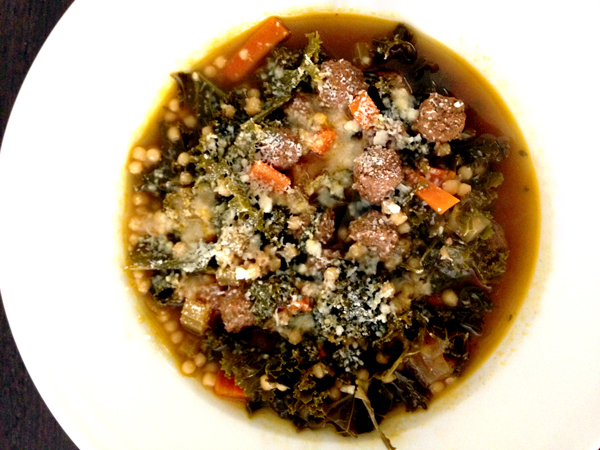 Ladle soup into serving bowls and top with freshly grated parmesan cheese. Enjoy with a crusty piece of bread.